Check out these brilliant Batman Party Ideas! 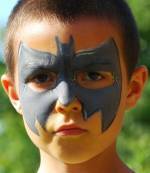 A Batman Party is just one of a number of superhero party themes that kids, especially small boys, enjoy. You can easily download lots of Batman logos, pictures and other bits and pieces from the internet which can be used for your party invites, decorations and games. You have to decide whether you want the new updated versions of these or whether you are old school! Tip: Some of the modern versions of the villains are a bit scary for young kids whereas the older one were more comic book. There are plenty of Batman bits and pieces easily downloaded to help you put together really good looking Batman Party Invitations. One of the villains issuing a challenge to any would be superheroes. A large Batman Logo above the door as you enter is a good start. Inside black yellow and grey/blue balloons are cool. You can buy various "Bat Bits" online and at most party stores. Alternatively download lots of pictures from the internet and make your own posters. Don't forget to include picture of the various Bat villains such as The Joker, The Riddler and Cat Woman. No Batman party would be complete without these wayward and disturbed characters being around. 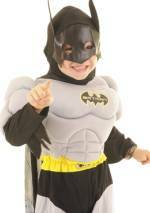 Most kids will come in versions of Batman Costumes or even Robin The Boy Wonder, some shop bought, some home-made. You may like to have a supply of black masks ready just in case anyone does not and feels left out. Batman T'shirts too needn't be too expensive if you buy cheap blank shirts and print your own. Another great and cheap option is face painting. Batman and Robin were renowned for their gadgets all of which came in big boxes clearly marked and always called Bat-..... something or other for instance Bat Lazer. You can put a lot more "Bat" into your party by copying this and simply using Batman logos on all the bits and pieces you use for your games. Even if that is something as straightforward as having a Bat Box to keep your equipment in. It is the little touches like this that will make your party really Bat-tastic! This is a nice easy way to start your Batman Party. You need 2 black balloons for this game. You can probably purchase balloons with bat logos on them. Alternatively paint or cover two round footballs. These are your Bat Balls. The first child is given the Bat Ball he passes this back over his head to the child behind who passes it back between his legs to the next child who passes back over his head. This pattern of over or under repeats until the last child in the line gets the Bat Ball. They then run with the ball to the front of the line, stand at the front and pass it back over their head thus starting the whole process of under and over again. The game continues until the original child reaches the last position in the line. On receiving the Bat Ball for the last time they run to the front of the line (their original position) and the whole team sits down. The first team to sit down wins. Line your kids up in a row at one end of the room. Your dastardly villain is getting up to misdeeds at the other end. But between our superheroes and him is a dangerous void that cannot be crossed. "In here is the solution"
The kids are all wondering what it can be. Milk the moment and then hand each one a toilet roll! But these are not actually toilet rolls but "Bat Conveyors"
On your command the kids all un-roll their conveyor towards the villain whilst they hold on to the other end. They can then use the conveyor to cross to the other side. But they must not step off the conveyor. When they safely reach the other side of course the Bat Conveyer doubles up as a handy "Bat Snare" for wrapping around the hapless villain. You'd be amazed how securely a dozen kids can tie someone down armed only with their handy bat gadgets! Another victory for the forces of good over evil! A4 (20 x 30cms) pictures (downloaded from the internet) of Bat Villains ie The Joker, The Riddler, Penguin etc. You need one for each child. 2 Balloon Pumps or 2 Hand Held Mini Fans or 2 Black / Bat Balloons. This game is very simple so you need to dress it up a bit and give it a bit of Bat Authenticity. Divide your kids into two teams and line them up at one end of your venue. Give each one a picture of a villain. Tell them to fold up the bottom inch so that it sticks up at right angles. Out comes your Bat Box (marked up appropriately). And you hand a blaster to the first child in each team. They put their pictures on the floor and, on your command, blast them with Bat Air to the other end of the room. Once there they return the blaster to the next child. If using balloon these should be inflated by an adult an the air released slowly using finger and thumb. (you need to have some spare balloons and adults to blow them up ready for the next child). The winner is the first team with all their villains blasted to the other end of the room. Oh No! Batman and Robin (or Batman and Batman) have been tied together by the evil Penguin and what is worse he has left a ticking time bomb behind! Will our desperate duo be blown to bits?! Fortunately they have some Anti-Bomb Bat Wrap and some Bat Tape. These will totally contain the blast. If only our heroes did not have one hand tied behind their backs. Still using their free hands and working together they might just make it! Each child is put with a partner. They are sat on the floor next to each other. They then hold hands and those hands are slipped into a sock and bound tightly behind them. They then have to work together using their free hands to wrap the bomb securely in the Bat Wrap. Best to cut a number of pieces for each team in advance and have them easily grabbable somewhere near. Give them about 3 minutes to wrap their bombs and then say stop. You could have an alarm that sounds. Examine each bomb in turn. Half the fun is in the half baked attempts of some teams. You could give each marks out of 20 to find a winning pair. These grabber / tongs make a great "Bat Prop". Divide your kids into 2 teams. Each member of the team in turn has to pick up and make safe something left by one of the villains. Riddle Bombs left by the Riddler ( tennis balls with a question mark drawn on them in black marker). Joker's Booby Traps (cardboard boxes with awful jokes written on them) which need to be stacked within each other and removed to a place of safety before the effects of over-laughing devastate vast swathes of Gotham City. Penguin Plutonium - Radioactive small items left by the Penguin which have to be picked up by the tongs and carefully placed in a Bat Beaker (plastic cup) before being dropped into a Bat De-radiator (cardboard box). Do you know any great Batman Party Games?